The road from Cape Town to Augrabies mainly follows the Cape – Namibia route, and this route is used by many trucks carrying produce between the two countries, and from the Northern Cape to the Western Cape. As such it sees regular heavy traffic, which has necessitated major road works to maintain the road. Shortly after Piketberg, and the Vanrhyns Pass, there are approximately 165km of near continuous road works with Stop and Go’s. 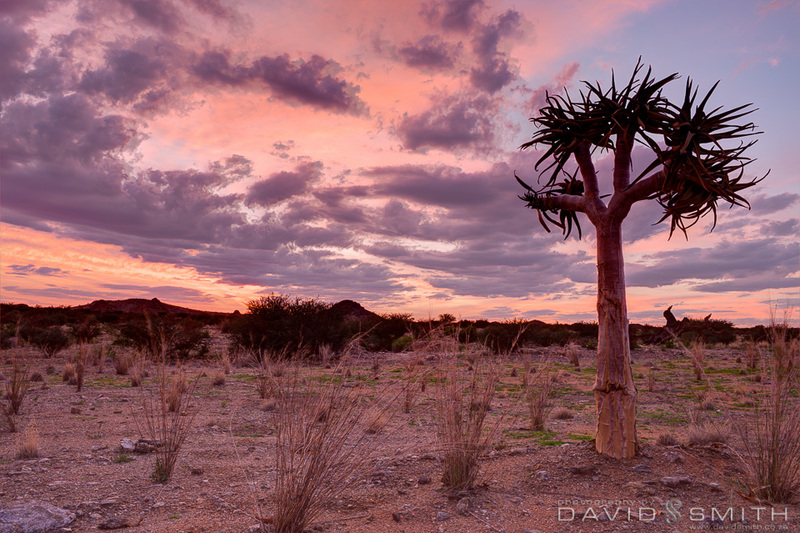 These will add approximately an hour to your travel time on this route North from Cape Town to Springbok, or Upington. As a result of this my drive time from Cape Town to Tutwa Desert Lodge was approximately 11 hours, with only stops for fuel along the way, and I arrived in the dark after 19h00. The access to Tutwa Desert Lodge is also a little complicated and involves about 25km of bad gravel roads, also with their own road works and some hazardous corners and potholes in the road, and this should be avoided and is not recommended at night! Gates close at 18h00, but fortunately the lodge staff were expecting me, and were waiting at the gate to guide me to the lodge. 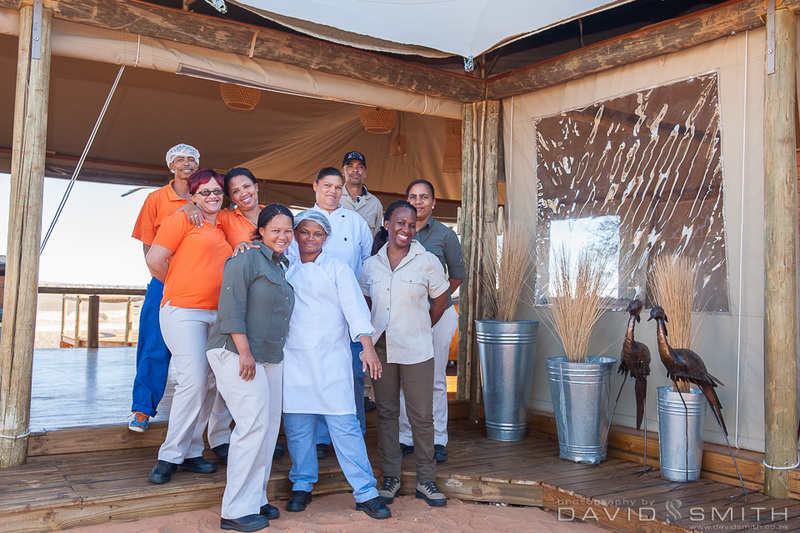 The lodge is run by management couple Craig and Charmaine, and Charmaine doubles up as chef in the kitchen, while Craig is a qualified fly-fishing instructor and does a lot of the river activities. Charmaine gave me a guided tour and Craig joined me for supper, which was a very tasty curry – fine fare for a cold winter’s night! 8 and 9 are external suites away from the main building, nice for privacy, but bathrooms are open-plan, which may not be for everyone. 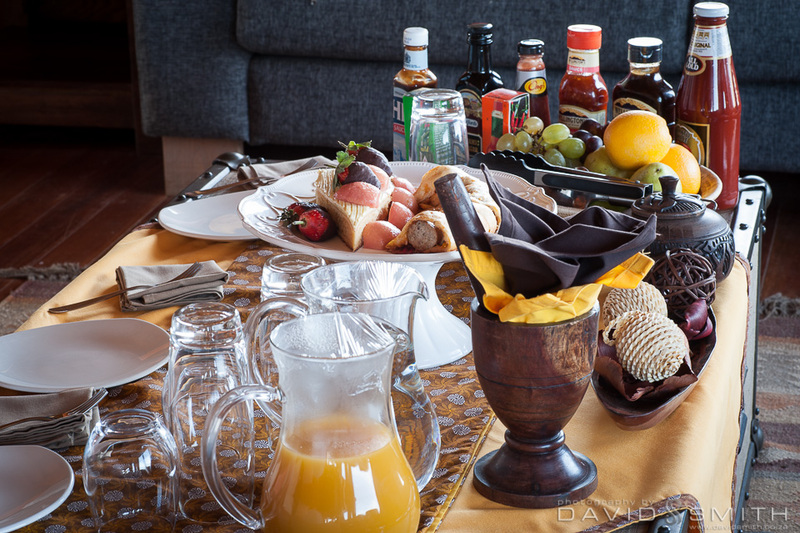 A total of 20 guests can be accommodated. The beds were very comfortable and warm, and rain showers very nice in the cold mornings. 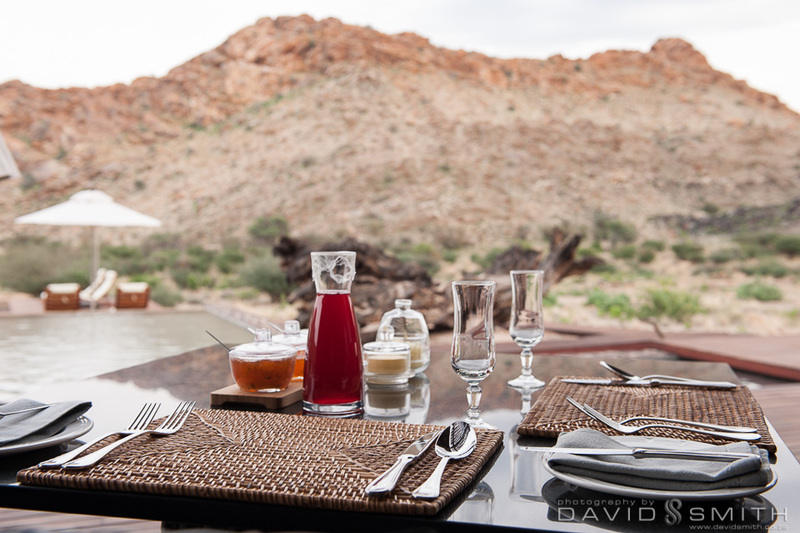 A lovely breakfast was served outside on the pool patio, and it was beautiful to watch a pair of black eagles patrolling the rocky outcrops while I drank my coffee. There are plans to turn the reception area into a spa, which I think will be a good addition to this property. 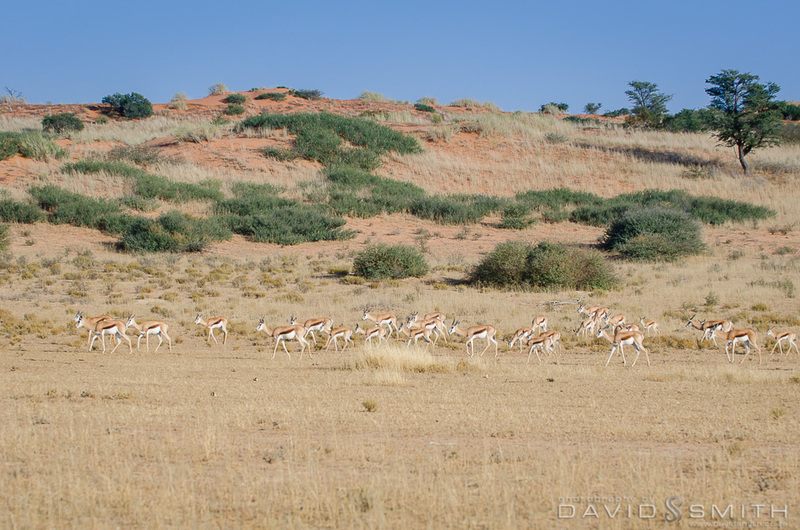 I did not get a chance to go on a game drive due to my itinerary, but there are plains game, including giraffe, zebra, gemsbok, springbok as well as surricates, aardvark and aardwolf, bat-eared fox, caracal, and apparently 7 individual leopards in the area. 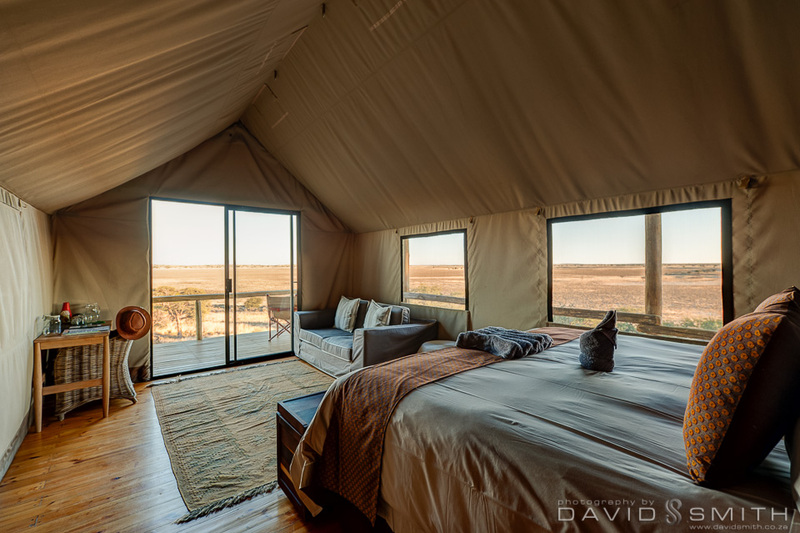 With over 20 km of Orange river frontage, this is ideally suited to adventure activities like canoeing and river rafting, as well as fly-fishing on the river. 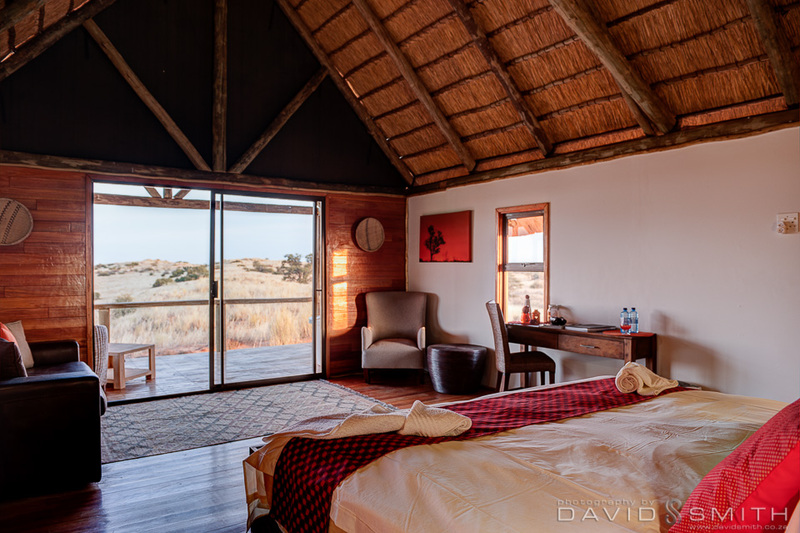 I left Tutwa Desert Lodge at 09h30 …. and after a pleasant drive on some very nice roads, arrived at Twee Rivieren entrance to the Kgalagadi at 14h30 … this was approximately 365km. Check in to the park was done through the Botswana parks desk, in the same building as the South Africa one, but whereas everything on the South African side is computerized, on the Botswana side they simply look at your booking papers, and then you enter your details in a ledger, and off you drive! No permit given, nothing! I filled up with petrol at Twee Rivieren and deflated tyres to 1.6bar for the roads in the park. From Twee Rivieren to the turn off at Rooiputs is approximately 25km in the direction of Nossob camp, and this is a nice opportunity for a game drive …. 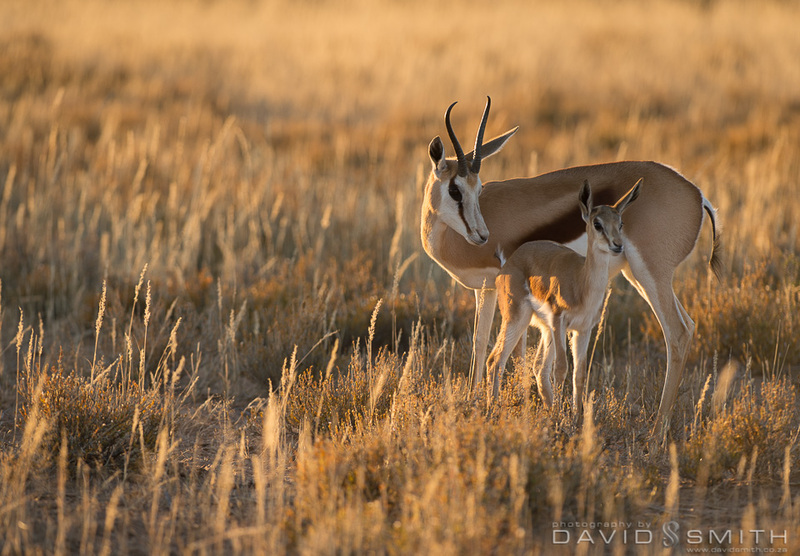 so time to slow down to 25 km/h and look for some of the wonders of the Kalahari – already by the time I got to the Rooiputs turn off I had seen many of the more common residents of the Kgalagadi – Wildebeest, Springbok, Gemsbok, Ground Squirrels, Whistling Rats, Sociable Weavers, Tawny Eagles …..
At the lodge I was met by the lodge manager Martin, ranger KB, ranger Chris and the “skinny” chef KG, and was given a cold welcome drink by Maggie. The staff here were very friendly and attentive, and the food by KG was excellent – he has training in 5-star hotels and it shows, great presentation, quality food, and plenty of it! Not overly rich food either – good wholesome tasty fair … One of the rangers or the manager joined me for meals and high tea. 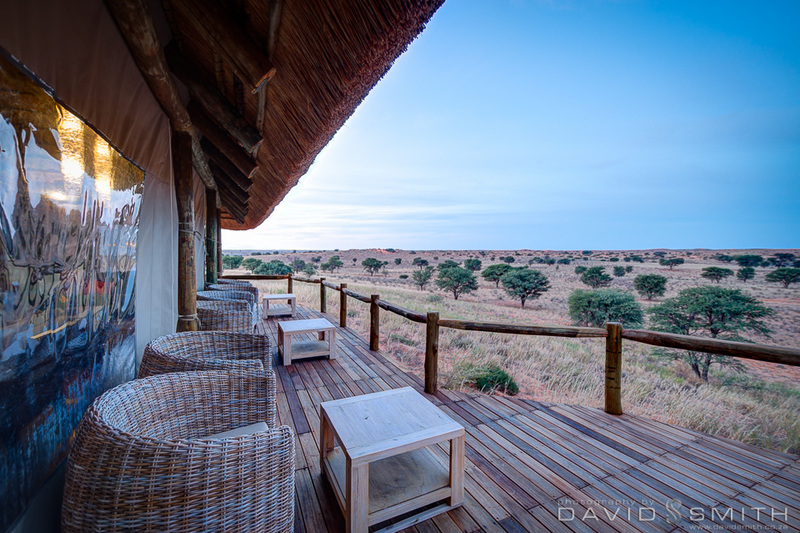 The Lodge has a beautiful location on top of the dunes looking out over a waterhole and the dunes away from the Nossob river bed. 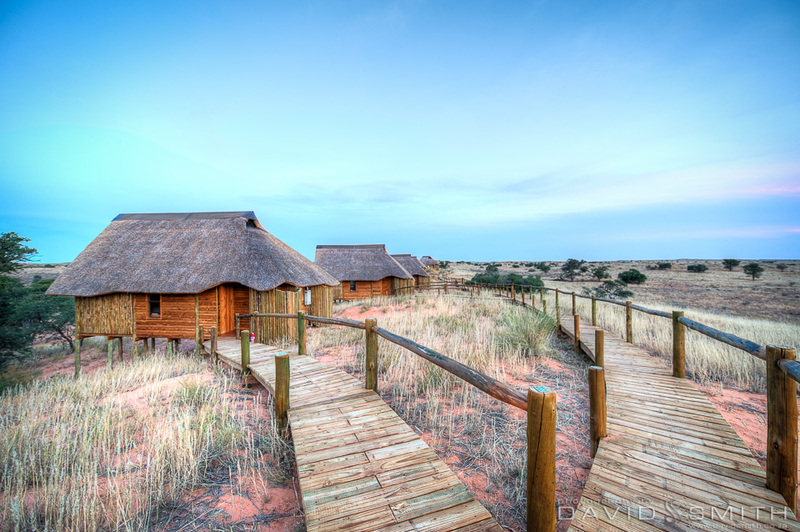 Rooiputs consists of 9 thatched chalets, of which one is the honeymoon chalet at the far right of the lodge, and one is a family chalet to the left of the main lodge. 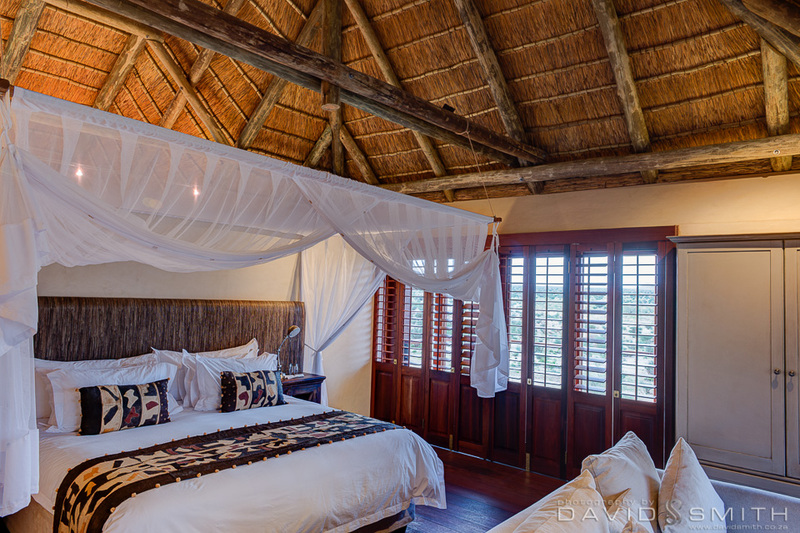 The honeymoon chalet has a bath on the balcony overlooking the sand dunes, which is quite an indulgence in a water scarce environment, but is otherwise the same size as the family chalet. Both the honeymoon chalet and family chalet have a sleeper couch in them to allow for children sleeping with their parents, and the chalets are therefore longer than the others. There are a total of 4 twins, and the rest of the chalets are doubles, although one is used by the Lodge Manager, so he is close at hand to the guests. 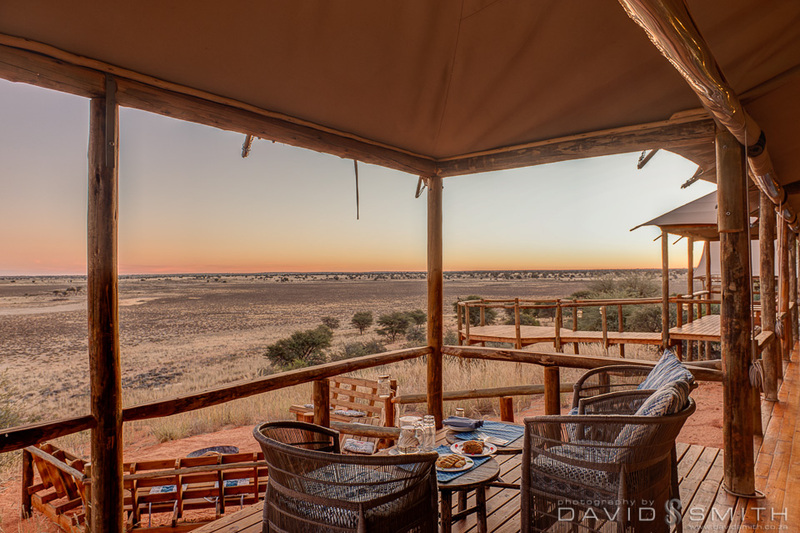 You have the choice of staying either as self drive or fully catered, in which case you get taken out on game drives in one of the lodge open game drive vehicle. 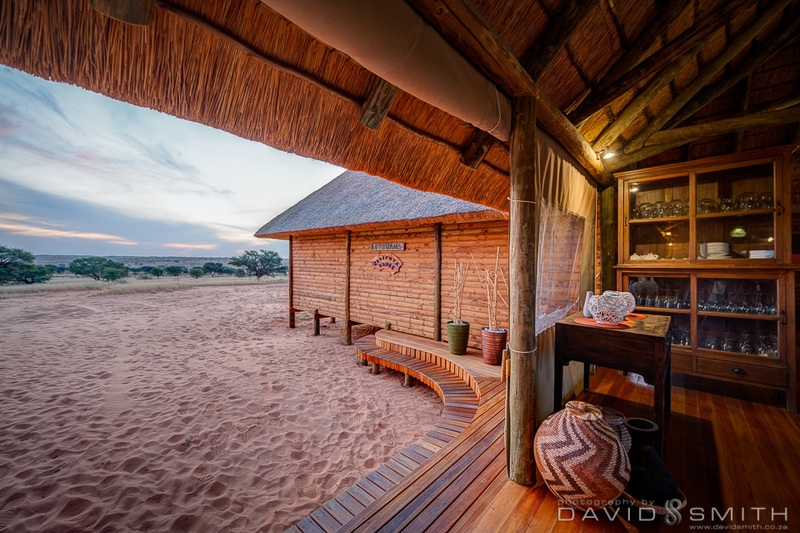 The Ta Shebube lodges currently have no additional game drive privileges which set them apart – they cannot do night drives, and they do not yet have access to their own game drive roads away from the main road. They have been given permission to carve a 25km path loop to the East through the dunes, but this is not complete, AND the game density is anyway generally better towards the river. 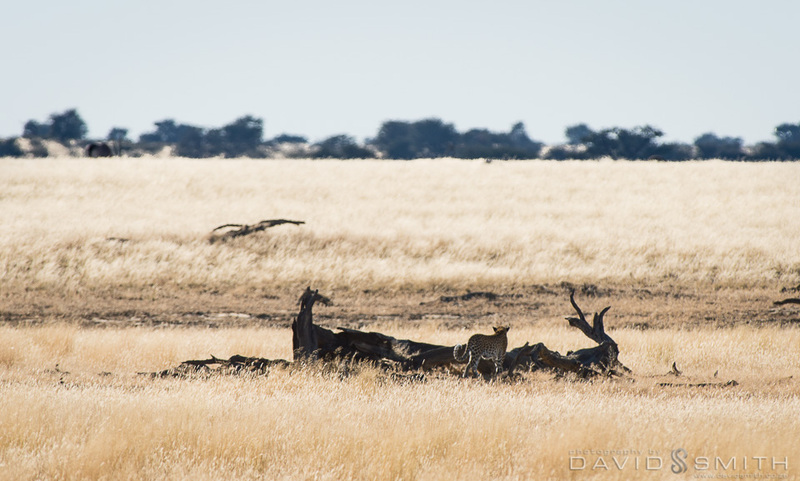 Rooiputs is renowned for predator activity, but it was fairly quiet while I was there – there were however large herds of Gemsbok, Springbok and Wildebeest in the area so, surely, the predators must be close behind! A big bonus was that there was a new moon while I was there, so the stars were absolutely spectacular. Rooiputs to Polentswa may not sound like a far way – 190km – but if you are driving at an average 30km/h you need almost 7 hours … so it is best to leave early – then you can have a nice game drive while it is cool, and do the majority of the drive when it has warmed up … windows up and aircon on! Even though this was winter day time temperatures were averaging 6 degrees in the early morning to 32 degrees at 16h00! I left at 07h00 and had a pleasant drive up to Nossob camp (130km), arriving there at 12h00. It is important to fill up with enough petrol for your trip northwards at Nossob – it is another 60km to Polentswa, and you still want enough petrol to do your game drives – I took a short break and drove on, arriving at the Polentswa turn off at 15h30. You will need a 4×4 at this point as the sand gets very thick up to the lodge. Greeting was very sweet – everybody comes out to greet and welcome you in song and each staff member introduces themselves to you. Malebogo is camp manager and KT ranger guide. Brief explanation about the lodge and welcome drink and cold flannel to refresh yourself. 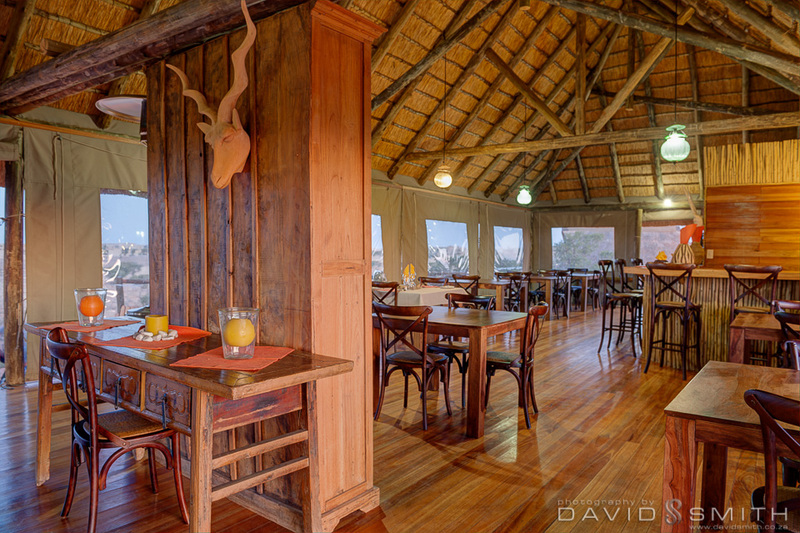 The lodge has nice open dining and relaxing areas with beautiful views over the pan. Gemsbok, Red Hartebeest, Wildebeest and Springbok readily evident on the pan and Kudu were sighted too. The birdlife is abundant, and to name a few – swallowtailed Bee-eaters, Kalahari scrub robin, red-headed finch, pin-tailed whydah, crimson breasted shrike, kori bustard, sociable weavers, fork tailed drongos are numerous. The tents are quite comfortable and even in the heat of the afternoon do not overheat. Tent 2 where I stayed is the honeymoon suite, Tent 1 is the manager’s tent – on the other side of the common areas, tent 3 is the family tent , and then there are tents 4 – 9 (9 currently also used as staff tent). The honeymoon tent and family tent are longer than the others and have a couch in them which can be opened to provide extra sleeping space. Tents 5 and 6 can be made into twins. All tents have outside showers on the balconies, which are screened from the sides but open on to the pan. All tents have their own solar powered hot water geyser, and there are also power points in the tents for recharging batteries, etc. 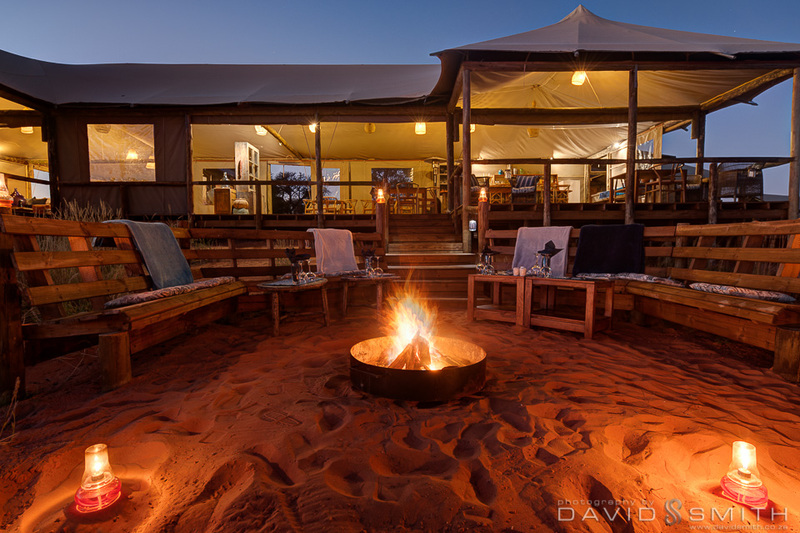 Here too, guests can stay either as self drive or as fully inclusive with game drives. Beds in the tents are very comfortable indeed with super pillows and duvets – very warm and comfortable. Towels here are very plush and nice, and feel great after a shower under the stars. Food was of a very high standard – very tasty and plentiful. Given its location and inaccessibility, the lodge staff have tremendous challenges when it comes to keeping food fresh and providing appetizing meals, and they seem to deal with the challenge admirably well! Early in the morning there were lion spoor all along the road next to the camp as they visited quietly last night, which was exciting to see. Polentswa water hole is just up the road to the right and well worth a visit – I continued further up the road which is in terrible condition and deeply corrugated – if you have a small vehicle you will not be able to see over the edges of the road and long grass in most places. In spite of the bad road, I was glad of my choice as I spotted a female leopard fairly far off in the grass near Lijersdraai water hole, and sat with her on my own for about 30 minutes as she amused herself by pretending to stalk a wildebeest and smelling where a male leopard had obviously previously scent marked on trees. A wonderful sighting and well worth the drive. Because the roads up north were so bad, I decided to stay by Polentswa waterhole the following morning and watch the Lanner Falcons hunt amongst the hundreds of doves. I saw a lot of Leopard tracks around the waterhole heading south down the road towards Nossob but could not see her. While I was at the waterhole, wildebeest, red hartebeest and springbok came to drink. 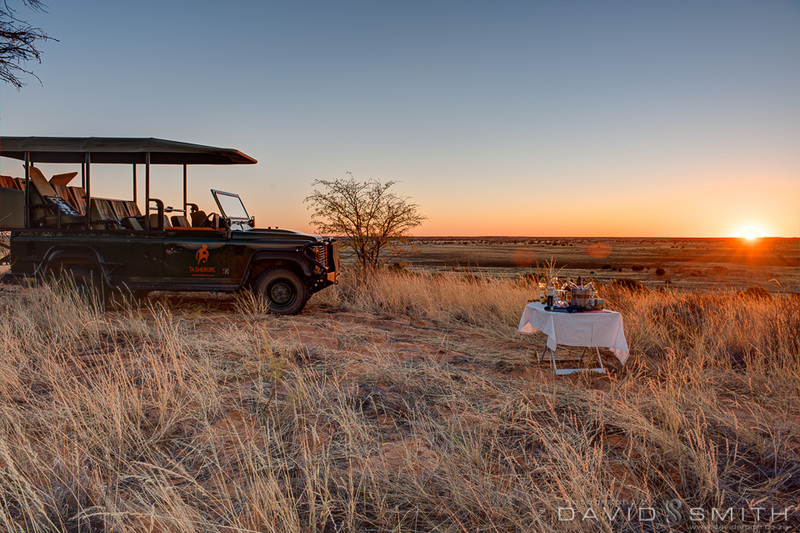 I asked the staff to show me their sundowner setup and they drove me around the pan towards the campsite and then up onto the top of a dune, where they set up their sundowners table. From here, they have a bush path 4×4 trail cut out where they could possibly take people on night drives – if they had permission – and we took this route back to the camp in the dark, which was very nice. 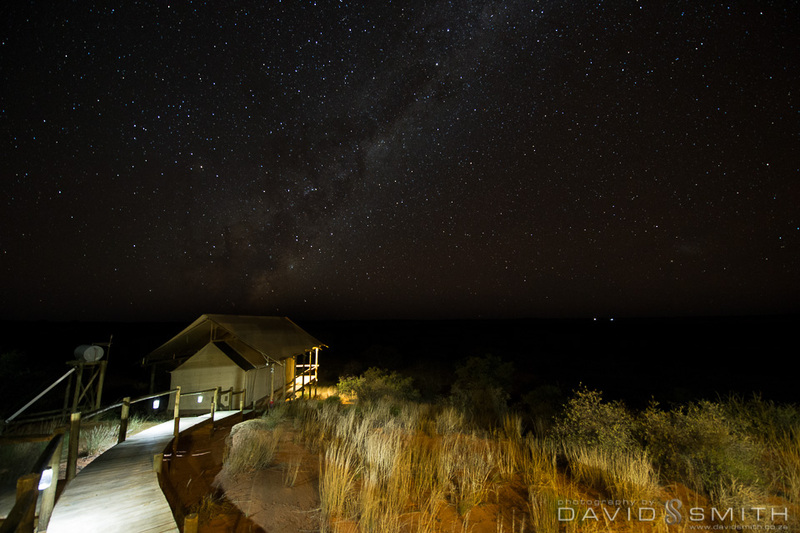 The stars up this side were also incredible, and we got some beautiful Milky Way shots before going to bed. 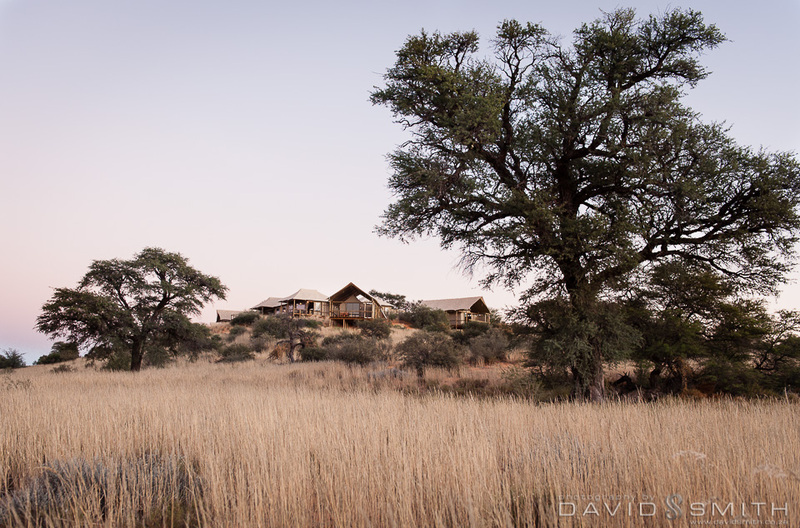 What makes Polentswa so special, is that it is far from the beaten track so you really feel you are in dark Africa, and your closest neighbours are the camp site 5km away. On the morning I left, there was spoor of two big male lions which had walked straight through the middle of the camp site … all the campers seemed to have very big eyes this morning! 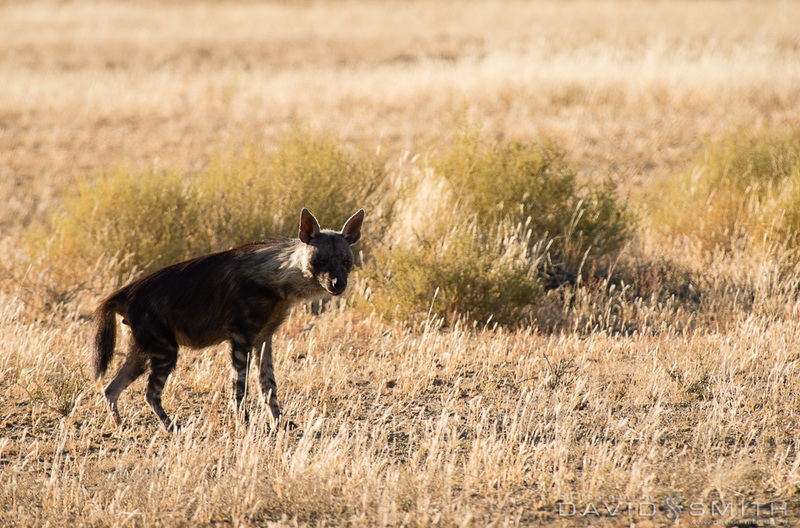 I left at 07h00 and had a nice drive down to Nossob, having a wonderful sighting of a brown hyena on the road down. I filled up with petrol at Nossob and then headed on to Twee Rivieren, arriving there at 16h00. I checked out of the Botswana side, and then into the South African side, at which point I was issued a permit for the park (!) and the keys for my room at Twee Rivieren. I filled up with petrol, ready for my homeward trip the next day, and headed off up towards Mata Mata for my last game drive. 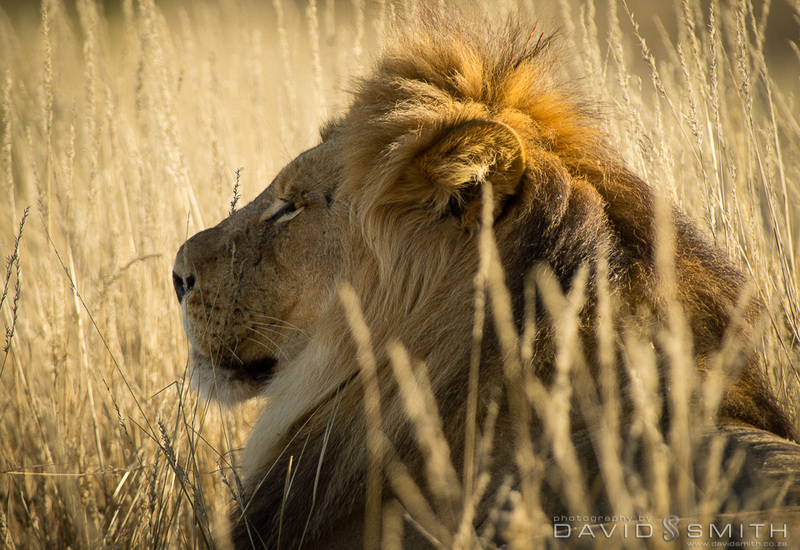 I was rewarded with a beautiful sighting of a lion couple in golden sunlit grass, which gave me something to smile about as I headed back to camp. Self catering, for my last night, I put some boerewors on the fire and made some rice and tomato relish to go with it … early bed and ready to push on home the next day. I set off at 07h00, and had a really pleasant drive through the Northern Cape on the R27 all the way until 300kms outside of Cape Town when I hit the road works again … not very pleasant, mainly because of impatient drivers being reckless ….. over Vanrhyn’s pass and into some fog and rain and knew I was approaching home … after 12 and a half hours I got home at 19h30. Seven days, three and a half thousand kilometres, and a very pleasant trip, with some beautiful properties. Thank you Ilanga!